What goes best with the perfect lip color? good breath, healthy gums, and clean teeth, of course! I’m a mouth-health freak. I love the feel of smooth teeth, I love to floss, and I scrape my tongue every morning. I carry a toothbrush, toothpaste, toothpicks, and dental tape (a.k.a. floss) in my makeup suitcase every day to work. It’s important to me on a number of levels. From my days as social worker in the world of providing HIV care I learned that maintaining mouth health is imperative to overall health. In the few clinics in which I worked, we had a dentist office on-site because when your immune system is compromised, a little tooth or gum infection – that the rest of us may ignore for months (or even years)- simply cannot be overlooked since it’s the gateway to the sinuses, the brain, and the digestive track. More than 10 years ago my then-boyfriend walked into my bathroom, saw my sugary, drug-store toothpaste and said: ‘once you try one of the natural toothpastes, you won’t be able to stand how fake and chemical-ly the one you’re using tastes.’ He was right; I think my first foray into the world of natural toothpastes was with Toms of Maine (it’s the most easy to find – thank you Trader Joe’s! [caveat: one of the ingredients you’ll want to avoid is SODIUM LAUREL SULFATE, a seriously not-good-for-you foaming agent, which is oddly included in some of the Tom’s of Maine toothpastes. I don’t get it!]) and I remember thinking how bland it was at first, and that it tasted nothing like my germ-killing, odor-blasting, bacteria-obliterating Crest, but that for the sake of my relationship, I’d give it a try. Months later I unearthed a travel-sized tube of my old brand to pack for a quick trip, and was completely grossed out by how sugary-sweet it was when I used it that evening. Over the past decade +, I’ve tried most of the toothpaste options from all of the natural food stores, and have been happy with nearly all of them. I still don’t like fennel toothpaste. Yuck! But that’s just me. I’m also a little bothered by the higher cost of non-toxic toothpastes. I recommended that my family try one I was enjoying a year or two ago and I remember my brother writing me back thanking me for the information I sent, but thinking that there was a type-o: there was no way it cost $15.00! 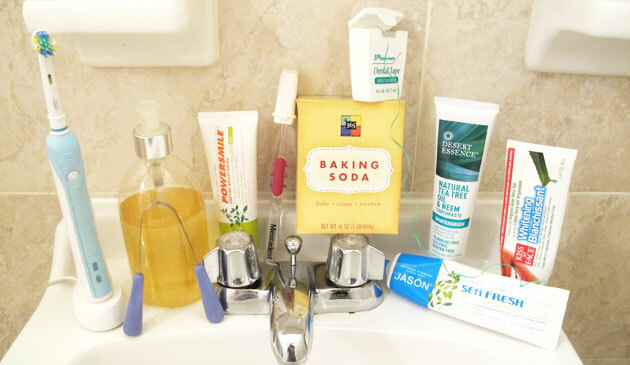 Recently a friend told me that I had to try her favorite toothpaste – and she’s one of those friends who always has the best suggestions for natural products – but at $50.00 a jar, I told her I had to pass! I tend to go for tubes that are under $6 and only use pea-sized amounts. I also often use straight baking soda to clean my teeth. It gets them their whitest and the little grains scrub out all of the microscopic holes, leaving them feeling super silky. Plus, it costs so little. The upside down U-shaped utensil with blue handles in the photo above is a tongue scraper. There are a number of different types, but this is my favorite since it really gets the job done. In ayurveda, it’s considered crucial to maintaining good health to clean the tongue of any coating that exists when you awake. One of the best gifts I ever received was an electric toothbrush. Weird, right? Does it make it more weird that it was from my boyfriend? I crave the gum massage and that intense clean it leaves behind. One final note about toothpaste ingredients. As a child my mom wouldn’t let the dentist give me flouride treatments because I always broke out in a scaly rash on my face afterwards. I’m grateful for that rash, and to my mom for paying attention to it. There are countless articles on the negative effects of fluoride – in our toothpaste and our drinking water (did you know that in most states drinking water is ‘enhanced’ with fluoride to strengthen our teeth?) It may actually work to strengthen teeth, but there have been numerous studies to disprove this, as well. I won’t go into all the nasty details about why and how flouride is bad for you, but the bottom line is that it’s been shown to help the brain absorb aluminum, which is NOT what we want, and it’s been linked to cancer… and flouride is simply not something our bodies need! A good diet full of fresh fruits and veggies and making sure not to leave food – especially sugar!- sitting on teeth after eating, and regular visits to your dentist for deep down cleaning is really all we need to hold onto our chompers for a life time. p.s. Mints and gum often have scary ingredients. 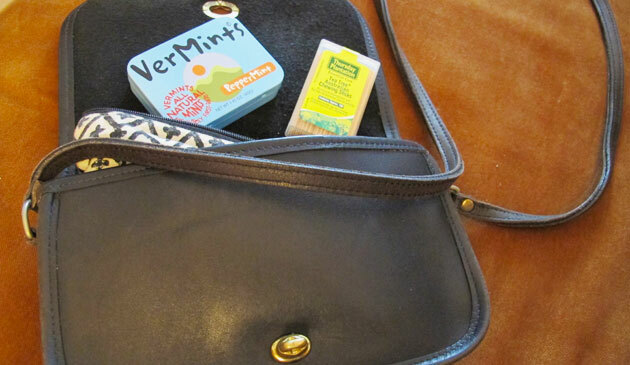 I’ve switched to natural mints from VerMints (made in Vermont with little pieces of mint leaves in them!) and tea-tree coated toothpicks for add a little burst of freshness when I need it).